With the increasing number of studies and research cases focused on dog behavior, communities are rapidly adding dog parks in subdivisions, county parks and other park like areas. 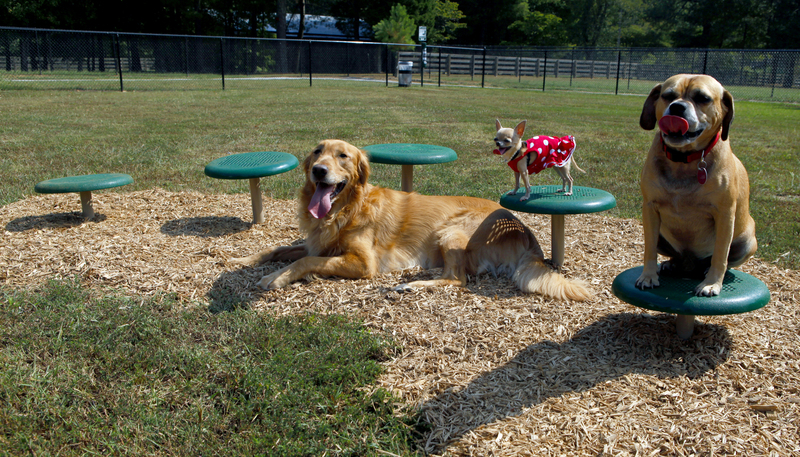 These dog parks now include equipment tested and designed specifically with dogs in mind. Dog parks provide enjoyable ways to recreate and exercise for dogs and their owners. Dogs can run around to their heart's content, explore new territory and different smells, play with other dogs, and play with new toys. Dog parks provide a social outlet for dog owners and dogs which can be beneficial to the community. Dogs are social animals and need to develop their own communication skills by meeting unfamiliar dogs. This can prevent the development of fear or aggression around other dogs. Owners can socialize with fellow dog lovers, develop a closer bond with their dog through play, and just enjoy the amusing behavior of the other dogs. Dog parks provide an opportunity to enjoy the outdoors and nature. Dogs love being outside with their owners, being energetic. Dogs need to lead active lives. In the past, dogs were hunters, herders and protectors with a great deal of social interaction. Today's dogs spend a great deal of their days alone, napping. They can become lonely, bored, overweight. It's no surprise when they find activities like chewing on shoes or raiding garbage cans to use up excess energy. Enough space for normal interaction. The area should be big enough for dogs to run around and space themselves out. If there’s not enough square footage available, a park can easily get crowded. Crowding can lead to tension among dogs and, as a result, fights can erupt. Secure fencing and gates Even if your dog reliably comes when called, it’s safest to take her to a securely enclosed area to play off leash. Before you let your dog run free at a dog park, make sure that fencing is sturdy and free of holes. It’s also best if the park enclosure incorporates double gates or an interior “holding pen” at the entrance, so people and their dogs can enter and exit without accidentally letting other dogs slip out of the park. Clean-up stations A dog park should have trash cans and bags available for people to clean up after their dogs. Water and shelter Especially in warmer climates, exercising dogs should have access to both drinking water and shade. A separate area for small dogs. Small dogs need exercise and play time too, but they can sometimes get injured or frightened by larger dogs. Many dog parks designate separate areas for smaller or younger dogs so that they can play safely. Today's dog parks offer agility-based courses which are expertly configured from novice to expert. There are combination courses for large or small dogs, hoop jumps, doggie crawls, dog walks, stepping paws, and teeter totters, to name just a few of the pieces of equipment available. A great example of this, is Bark Park Products from Ultra Site. The equipment can even mimic a wooded area with tree stumps, log tunnels, and stepping stones. There are even pet waste stations marked with signage available with hand sanitizer. Please make sure your dog is fully vaccinated and protected against fleas. Always observe your dog to make sure their interactions with other dogs stay friendly. Dog parks are really good places for dogs who love to interact with other dogs. Bliss Products has the expertise and products to make your dog park a welcome addition your community in public parks, multi-family housing areas, rest areas, hotels, RV parks, airports, and doggie daycare centers. Their products are slip-resistant, durable, resistant to vandalism, all weather, UV protected, and urine resistant plus made in the USA.